Most of us likely think of New Zealand as that green little thumb of an island, right next to that larger fist of an island in the South Pacific—the one where Mel Gibson, Nicole Kidman or Russell Crowe hail from. Think of Rebecca St. James, the Newsboys, and Darlene Zschech, just to name a few. Yet things seem to be changing on that front. New Zealand is also determined to tell the world about Jesus via global worship and song. Case in point: The Parachute Band. 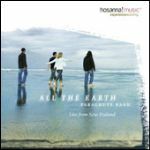 With a new live CD on the shelves—All the Earth: Live From New Zealand—the Parachute Band is flying high these days. With six albums under their belt (all of which have reached gold status back home), not to mention three nods from the New Zealand Music Awards—where they’ve thrice won for “Best Gospel Album”— they are now more popular than ever. All the Earth, the band’s seventh album, is their best yet. Listen to song clips or buy All The Earth at Songs4Worship.com! So what makes All the Earth so special? Well, it’s in part due to the vast array of New Zealand songwriters who have lent their pens to this project. In fact, over the past eight years, the Parachute Band has culled worship songs from all over their native country, and sought to promote them—not only via recording, but also at the Parachute Festival, where since 1996, they have led worship. Over 25,000 worshipers attended the festival in January of 2006. The solution? To bring those songs out into the open and celebrate them, which is what they have done, not only at the annual festival, yet on all of their albums. The foursome is adamant about championing forgotten songs. They’re worship sleuths, always searching for good songs to celebrate—songs that are born away from the fanfare and miles away from the spotlight. The band consists of Libby and Wayne and Rhys and Julian, who all seem to prefer to operate on a first name basis. As for the sound of the Parachute Band, it’s evolving and eclectic, dabbling in pop/rock and R&B and funk and Gospel, etc. In other words, they’re not shy having a mish-mash of influences. They prefer to keep the music simple and singable, just like worship should be. Yet those lateral influences only serve to feed their vertical commitment to worshiping God and leading others in that process. Amen to that. And it’s that heartbeat for authentic worship that propels the Parachute Band to continue its free-fall of heartfelt worship, as well as their quest to champion songs that put a smile on God’s face. —Will Banister is a freelance writer living in Nashville, TN.